The 10-year anniversary of the Arizona Game and Fish Department’s (AZGFD) life jacket exchanges continues with two more events: Lake Powell on June 9 and Big Lake on June 23. (Please note that the Big Lake event was rescheduled from its original date of June 16 due to weather.) During the exchanges, people with old, worn out and less-effective life jackets can swap them for a new one, while supplies last. 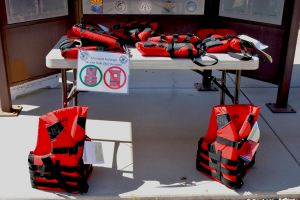 Big Lake at the South Cove boat ramp on June 23 from 1 p.m. to 3 p.m.
Last year AZGFD swapped more than 800 old life jackets for brand new, fully functioning life jackets in the person’s appropriate size. And this year the department is aiming to reach 1,700 people with new life jackets — a record-setting number for the state. The exchanges at Lake Powell and Big Lake follow eight events that were held on May 19 to kick off boating season in Arizona. Before heading out on the water, it’s important that boaters check to ensure that their life jackets are in good condition and that they are the right size and fit for passengers. When inspecting life jackets, look for any rips or tears, missing straps, broken fasteners, and to ensure that the flotation hasn’t shifted. Based on observations from AZGFD’s boating education program, life jackets should be inspected each boating season due to the environment’s impact on their materials. State law requires all passengers 12 years old and younger to wear a life jacket while on board and each passenger must have a properly fitting, U.S. Coast Guard-approved life jacket available.